WINTERS, CA — In 1998, the Centers for Disease Control and Prevention released the results of one of the largest studies ever conducted to assess the relationship between childhood trauma and adult well-being. Over the course of two years, 17,000 individuals underwent physical examinations and answered a multitude of questions about their family history. Was a biological parent ever lost through divorce or abandonment? Did a parent or adult ever make them afraid for their physical safety? It was called the Adverse Childhood Experiences study (ACEs), and it solidified for health professionals what had only been guessed at before: severe stress during childhood impairs the brain’s development and function, leading to long-term health effects such as chronic disease and depression in adults. Science and health reporter Jane Stevens was struck by what she saw as the profound implications of the study for helping to explain problems plaguing families and communities, from obesity to substance abuse to incarceration rates. Since the 1980s, Stevens had covered the emerging field of violence epidemiology, which looked at violence from a public health perspective, for newspapers and magazines. Stevens saw ACEs as a watershed moment, one with huge implications for both the field and the way in which it should be covered. She envisioned an online resource that would take important findings from ACEs and translate them for a broad audience through stories and reporting. Such a site could become an important resource to help organizations and local governments address the issue of childhood adversity and its consequences. It would be 14 years between the study’s release and Steven’s ability to create such a resource. In the interim she taught at UC Berkeley’s Graduate School of Journalism, was a fellow with the Reynolds Journalism Institute in 2008, and worked as the director of media strategies for The World Company in Lawrence, KS, where she helped build a local health news site called WellCommons. In 2011, she left her job at The World Company and launched ACEsTooHigh.com within six months. The site has a number of goals. It provides background and subsequent research on ACEs, and also presents news on topics such as developmental neurobiology and epigenetics. It is a platform for personal stories told by individuals who experienced childhood trauma, and it reports on how communities across America are addressing the issue of childhood adversity through policies and programs. Alongside ACEsTooHigh.com, Stevens launched ACEsConnection.com, a niche social network mainly for professionals in education, criminal justice, public health, and government that work on ACEs related issues. The network today has over 950 members. In one of Stevens’s most popular stories, she focused on Lincoln High School in Walla Walla, WA, where the school principal had implemented a radically different approach to school discipline that emphasized a more compassionate, talk-oriented strategy in response to bad behavior. It led to an 85 percent drop in student suspensions and made the principal a convert to the idea that traditional punishment was often just doling out more trauma to already traumatized kids. The story received 375,000 views on the site, in part because it prompted a lengthy dialogue on Reddit. Not every story has received the same amount of attention, but Stevens repurposes some of her material for the Huffington Post, which drives traffic to the site. Other news outlets are free to republish stories from ACEsTooHigh.com with attribution. Stevens funded the launch of ACEsTooHigh.com with personal savings, and continued to support the site out of her own pocket for the first six months of operation. After the publication of the Walla Walla story, she was contracted by the California Endowment to produce an investigative series on schools that are using trauma-informed care to pioneer new programs and strategies for discipline, and the ethnic media organization New America Media will be publishing some of the resulting stories. Other than a part-time resources administrator for ACEsConnection and a couple of volunteer contributors, Stevens produces, edits and writes the majority of the content. She plans to approach potential funders in the near future for financial support and aims to hire a full-time community manager for ACEsConnection and several reporters for ACEsTooHigh when funding materializes. Neither site is incorporated. Currently at work on a book about the link between child trauma and adult health, Stevens hopes to develop a network of local health reporting sites that will incorporate her experience at both WellCommons and ACEsTooHigh.com. Her vision is that the network will generate revenue through hyperlocal advertising, and sponsored content from health care providers and experts. (WellCommons, she notes, was operationally profitable in its first year through its use of a similar ad model.) She envisions a network of five local health sites in Northern California, for example, that could eventually provide enough seed money to fund an investigative site undertaking ambitious reporting projects. 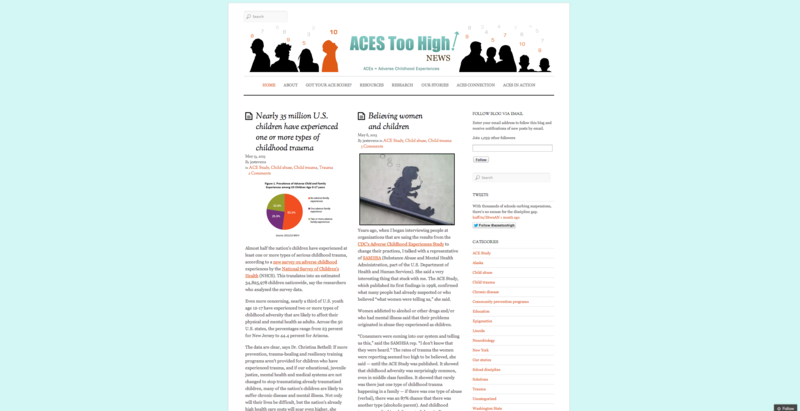 ACEsTooHigh.com has been a crucial step towards building that larger network, Stevens explains, because it provides a foundation for understanding and reporting on childhood adversity and public health. “I realized that I really needed to do [ACEsTooHigh.com] first if communities were going to have to have any chance to achieve their health goals.” Moving deeper into specific communities is the next logical step.